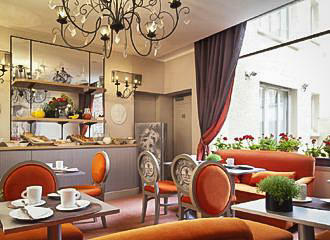 The Hotel Residence Foch is a 3 star hotel located in the 16th Arrondissement of Paris and certified disabled friendly it has a lounge, bar, breakfast room with American style buffet breakfast on offer, free WiFi, business corner, laundry and concierge services and much more. 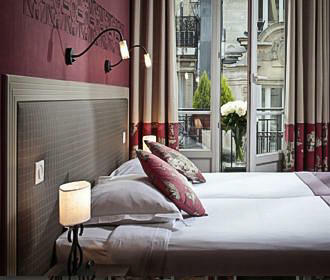 In a quiet residential area of the city surrounded by Haussmann style buildings, the Hotel Residence Foch has a chic and refined atmosphere with air conditioning or heating throughout the hotel depending upon weather conditions, plus it is certified disabled friendly and has family rooms available as well. Having a 24 hour reception with staff able to offer concierge services such as making restaurant reservations plus a business corner where you have access to a computer, printer, fax and scanner, along with free WiFi throughout the hotel, are just some of the services on offer. There is a safe for valuables, a laundry service plus an iron and ironing board available upon request and an inner courtyard that people who smoke can utilise for this purpose, as the entire hotel itself is non smoking. The Hotel Residence Foch has a comfortable lounge area where you can sit and relax along with a fully licensed bar where drinks can be served 24/7, plus there is a breakfast room where an American style buffet breakfast is served of a morning, although if you prefer, you can have a continental style breakfast served to your room. 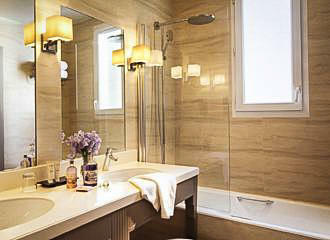 There are a total of 25 unique rooms at this small, friendly 3 star hotel in Paris that have been designed with traditional and refined aspects referring back to Marie Antoinette, yet with all the modern conveniences you would expect. Cosy and elegant, each room has its own en suite bathroom complete with a hairdryer and within the rooms you will find a flat screen LCD TV, a courtesy tray for making tea and coffee, personal safe, plus a direct line telephone with unlimited calls and some have a desk or table and chairs. Some of the rooms at the Hotel Residence Foch have a balcony or even a terrace with table and chairs like the Superior Room, plus there is a double room called the Romantic Room that has a canopy over the bed, and another designed specifically for the disabled with wheelchair access. Another called the Junior Suite has a separate living room with a sofa bed that can convert to two singles or a double and the bathroom has double sinks along with a separate toilet. There are also the family rooms consisting of one room with a double bed and the second with a sofa bed that again converts to singles or a double, which also include the same features in the bathroom as with the Junior Suite. 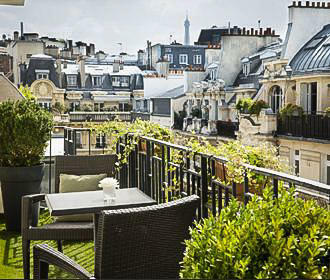 Located in the 16th Arrondissement in a quiet area, the nearest Metro station to the Hotel Residence Foch is Porte Dauphine stop serving line 2. However, in the opposite direction you have the Porte Maillot stop serving line 1, but at the same location is the Gare de Neuilly train station for the RER line C.
Yet if you are travelling by Bus then line PC1 will get you the closest to this 3 star hotel, although lines 73, 82 and 244 along with the Noctilien Night Bus Service via line N24 are also within walking distance. In addition to this, Les Cars Air France also stop at the Porte Maillot before travelling on to the Charles de Gaulle Airport.